Between cards that show two people on a single card – not just these guys, but also Pia and Kiran Nalaar or Tibor and Lumia – and the two separate cards that show a single tag team in Battlebond, it might get a little hard to tell exactly how many cards people are talking about in the coming months. 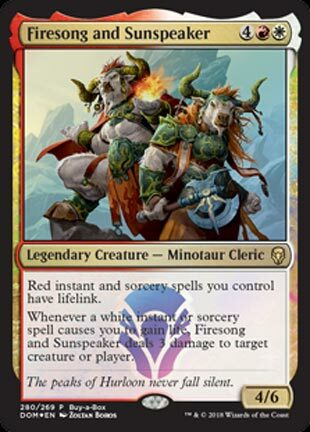 I think it’s kind of funny how we’ll be, say, Unsummoning Firesong and Sunspeaker with one card, yet we won’t be able to do the same thing to a Battlebond team unless we use Undo or Evacuation. I think it’s easy to underestimate how dangerous giving red damage spells lifelink is. You know how Lightning Helix seems kind of cheap, mana-wise? Imagine Lightning Bolt doing the same thing at half the cost. You know how Volcanic Fallout is absolutely devastating? Imagine someone gaining 16 life from it. You know what happens when you have these guys out along with Mana Reflection, and you use Magus of the Candelabra to untap some lands in the middle and then cast Comet Storm? Me either, but I kind of want to see it now. (Not to mention using that second ability in conjunction with Sun’s Bounty!) Six mana will definitely keep them in check in competitive Magic, but Boros-colored Commander decks will be running on their abilities for years to come. Speaking of Battlebond, I should expect that an expansion themed around two-versus-two combat would have some references to tag team wrestling in it. Would a single card called Twist of Fate be too much to ask? Well, this was controversial. Firesong and Sunspeaker is the Dominaria buy-a-box promo, with the caveat being that it actually wasn’t in booster packs. It’s a unique legendary creature with a nifty effect, even if it’s maybe not particularly “good”. I should amend that: Firesong and Sunspeaker isn’t good in Constructed. In Commander, it’s legit as heck. Lifelink on red’s suite of burn spells makes a board wipe brutal in your favor, and if the spell is red and white? Even better! Turning life-gain spells into a quasi-Lightning Helix is a nice touch. There’s a lot of interesting things these minotaurs do, even if six mana is too much to make work in Constructed. Elsewhere, though, they’re nice.